This recipe is absolutely positively decadent! And at only 10g net carbs, I've found my daily dose of dark chocolate, which is good for diabetics too! 1. Preheat oven to 325ºF. Coat an 8 x 8-inch baking pan with cooking spray. Set aside. 2. In a medium bowl, mix together the four, cocoa powder, baking powder, and salt. Set aside. 3. In a microwave-safe container, add the chocolate chips and butter. Microwave for 1 minute. Remove from the microwave carefully and stir the mixture until it is smooth. Add the melted chocolate mixture to a large bowl. Let cool for 5 minutes. If a microwave is not available, heat a small saucepan with 1/4 cup water, bring to a simmer. Put a mixing bowl on top and add the chocolate chips and butter. Stir mixture until melted, about 5 minutes. Add the melted chocolate to a large bowl, let cook for 5 minutes. 4. Add the sugars, sour cream, applesauce, chocolate syrup, egg, egg white, and vanilla to the melted chocolate mixture and stir until well combined. Slowly add the four in thirds to the chocolate mixture. Do not overbeat; mix until just combined. 5. Pour the mixture into the prepared pan. Position the oven rack to the lower third of the oven. Bake the brownies for 15 minutes. Insert a tester. 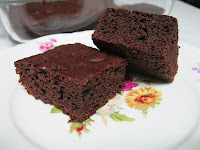 The brownies should look slightly under-baked and the top should look fudgy. 6. Remove the pan from the oven and place on a wire rack. Let the brownies cool for 2 hours in the pan. The brownies will firm up a bit. Cut into 20 squares. The original recipe calls for temp of 325ºF for 15 minutes. Even with checking the accuracy of my oven with a thermometer, these were nowhere close to being even slightly underbaked, let alone firming up after 2 hours. So back in the oven at 350ºF for another 15-17 minutes. To draw out the flavor of chocolate, it is recommended you use 1/2 to 1 tsp of espresso powder. Since this recipe called for chocolate syrup, which I didn't have, I substituted with the coffee flavor syrup. You don't taste the coffee flavoring at all. Instead of butter, substitute either butter-flavored Crisco or butter-flavored Spectrum. Believe it or not, neither one contains trans fat. Then, I compared Land O' Lakes margarine which contains 80% vegetable oil. Good grief, it contains 2g of trans fat. Bye-bye Land O' Lakes.